Star Wars opens in the middle of the rebellion against the Galactic Empire. Princess Leia, one of the leaders of the Rebellion, is caught using a diplomatic ship to transport plans for a space station/super weapon the Empire is panning to build. Through the machinations of two Droids, R2-D2 and C3PO, the plans eventually come to Luke Skywalker, a young boy with dreams of seeing the wider universe. These plans lead to the death of his foster parents and the discovery that he is descended from a great Jedi warrior. Another Jedi, Obi-wan Kenobi, agrees to train Luke in the ways of the Force, and they escape the planet with the plans on the Millennium Falcon, a starship piloted by brash smuggler Han Solo. Eventually, Skywalker, Kenobi, Solo, Solo's first mate Chewie, and the Droids find the space station, only to be trapped there and have to fight their way out, rescuing Leia in the process. They get the plans out to the Rebellion, which identifies a weakness. 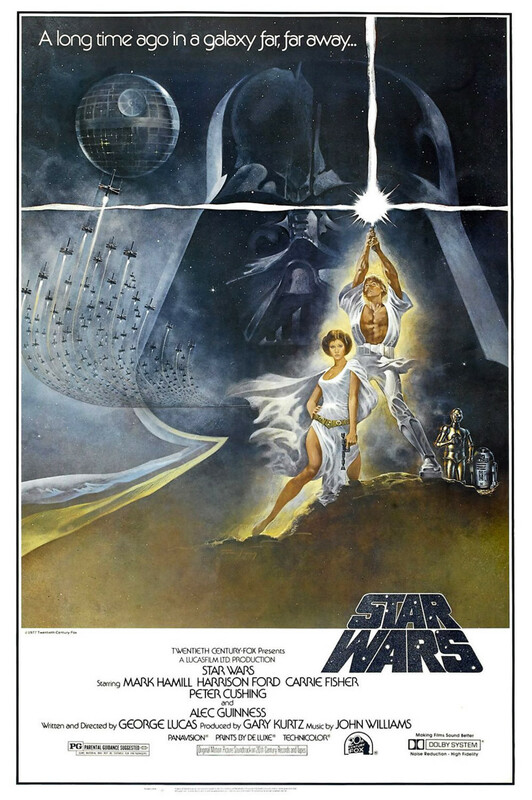 They launch an assault on the station, called the Death Star, and Luke manages to destroy it.